Early on a Friday night in an artist's loft in Bushwick, New York, Ted Cruz was setting up a Halloween rave party for Bernie Sanders. Not the real Cruz — the perpetually bemused-looking Republican senator from Texas who's also running for president — but his hipster Halloween doppelganger, a freelance artist's assistant named Steve Panovich. He was sporting Cruz's signature slicked-back side-part and suit as he arranged hand screen-printed "Bernie is Bae" — slang for babe — coasters and Sanders volunteer registration forms around a bowl of candy. Lined on one wall of the apartment were t-shirts for sale, some sporting locally-themed slogans, including "Brooklyn for Bernie" — the borough where Sanders was born and got his distinctive accent, in the heavily Jewish area of Flatbush. Brooklyn is also where his rival and fellow Democratic frontrunner Hillary Clinton, who's ahead in national polls, has set up her 2016 campaign headquarters. Yet people at the party said the Clinton campaign was remarkably absent on its home turf -- in a borough of New York City whose name has become a global buzzword for everything young and cool. In fact, their enthusiasm showed how Sanders has captured people 18 to 34, the Millennials who are the largest demographic group in the US, with a message that resonates strongly with them and massive social media clout. Each reveler had arrived having pre-paid entrance with an online donation to Bernie 2016 for $20 — two-thirds the amount of the Vermont senator's current average campaign contribution. It was Panovich's fifth time hosting a Sanders event. At the first gathering in late June, the candidate streamed a video message to the crowd, which was projected onto a wrinkled bedsheet on one of the loft's high walls. It was one of 1,500 events Sanders "appeared" at that day via streaming. "I've always been politically aware but never engaged in the process — I guess I've never really had a reason to campaign until now," Panovich said Friday night. In New York City, Panovich said, Sanders still has no organized infrastructure. The campaign relies on grassroots organizers like him, and only provides volunteers with a basic online toolkit that includes a guide on "organizing without forming a PAC." So far, there's been no shortage of events in New York, hundreds of them, with many hosted by Millennials, who are Sanders' biggest supporters. 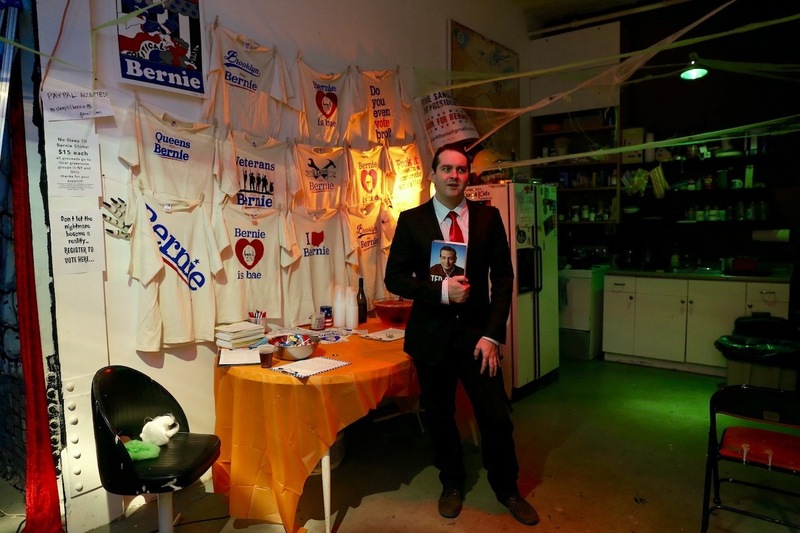 Over the weekend, Panovich's loft party was complemented by numerous other gatherings across the city, from a Bernie Sanders Pumpkin Carving party to a Bernie Halloween parade through Manhattan's West Village. Mothers shared Photoshopped photos of their babies, with halos of unruly white hair and glasses. The tongue-in-cheek tributes joined the dozens of Bernie Sanders memes that have lit up the Internet and helped turn him overnight from a self-styled Democratic Socialist from a small state into a powerhouse on social media. Among 75 million people in the Millennial demographic, Sanders is just three percentage points away from Clinton. Yet the Clinton campaign does not, according to some activists, fight hard enough for their votes. "I've been out on the street working events and flyering in neighborhoods around the city since Bernie announced he was running in late May, and I haven't seen one Hillary or [Martin] O'Malley volunteer out there," said Brooklyn resident Paul Sliker, 27, who organized the Sanders parade in the West Village Saturday. Despite Sanders at 74 becoming a runaway sensation with young fans — some of whom are three times younger than him — that support will not necessarily translate to actual votes, especially as political engagement among Millennials appears to be tumbling. Last year, voter turnout among 18-24 year olds fell to an all time low to just 19.9 percent in the midterm elections. Meanwhile, Clinton is also still enjoying more support from Democratic voters, across all age groups, according to an October Economist/YouGov poll. Yet, looking at the numbers, Sanders has clearly captivated a younger audience. And members of that audience Friday night lovingly embraced Sanders's no-nonsense persona and quirks, including his unmistakable Nu Yawk talk -- "Say 'Supreme Cawt! '," yelled one partygoer to another dressed as the candidate. That unscripted approach may be a major factor helping Sanders among young people, and contributing to his remarkable fundraising numbers. He raised $26 million in the third quarter alone, mostly from small individual contributions. Sanders doesn't even try to charm young people with pop culture references and critiques from candidates that risk falling flat. "There's a reason other candidates are not hitting the pitch," said 24-year-old Matthew Collura, who co-manages the Millennials for Bernie site with a group of young professionals. "The pitch is honesty, and as much as I like O'Malley's policies, he's very trained and I think the classical training that politicians are undergoing is going to end up harming them. 'Hillary is a very good speaker' is a phrase I hear a lot, and I agree. She's very controlled. I don't know who she is." The popularity of his curmudgeonly character has actually been an unexpected outgrowth of the campaign, said Liesbet van Zoonen, author of Entertaining the Citizen: When Politics and Popular Culture Converge. "His success is about his politics much more than his persona — young people are not stupid and won't go for a candidate who is desperately trying to be cool," she said. "The dance parties and the memes seem to be an expression of joy that there is finally a candidate that speaks to their substantial concerns. Obviously there will be many followers who are just that — on the bandwagon rather than truly committed, but with social media storms, once it's running it will take a while to slow down." A May 2015 survey of college students by the Panetta Institute suggest the most important concerns for young people revolve around action on climate change, reducing student debt and the cost of college education, creating jobs, equal access to economic opportunity, and gridlock in Washington. Sanders's economic inequality-focused agenda incorporates many elements of these issues, including policy proposals to make tuition free in all public universities and colleges, and regulate Wall Street by reinstating the Glass-Steagall Act to create again a wall between commercial and investment banking. At the first Democratic debate this month, Sanders also called climate change the "biggest national security threat in the United States," earning cheers from the crowd. "Top concerns that students have had for years are student debt and the climate crisis, but Bernie was the first candidate to make those his priorities in a forceful way never done before, by laying out his record which shows he's been a consistent fighter for the environment and for students," said Moumita Ahmed, 25, an organizer for a number of Sanders grassroots groups. The desire for honesty and a consistent record is by no means unique to the Millennial generation. But younger voters have greater access to and facility with technology, including the ability to look up campaign finances online, instantly research a claim made at a debate, or google a candidate's record or history on any given issue. "We are a generation that can easily fact-check anything," Ahmed said. "We will not be tricked by media or campaigns," Collura said. "I want to know the context and I like doing the research. It's bad maybe for the mainstream Democratic institution because whether I like what they're saying or not, I don't want a noise chamber. I want unfiltered truth, even if I don't like it." In recent weeks, murmurings in media have suggested Sanders has a problem with women, which has in turn given birth to the concept of the "Bernie bro" — or the idea that Sanders's campaign is dominated by young, white, liberal men — though the numbers tell a different story, one where Sanders has only a marginal 2 percent gender gap between male (24 percent) and female (22 percent) supporters. "The Bernie-bro stuff is just not true," said Ahmed. "Millennials for Bernie has more women supporters than men… The grassroots movements that are far more active with far more supporters and far more reach are all organized by mostly women from College Students for Bernie to Millennials for Bernie to People for Bernie and African Americans for Bernie. All of these grassroots groups were founded or co-founded by women." But supporters are well aware that Sanders remains a long shot to snag the Democratic nomination. "Some days I think he's got this in the bag, there are other days you think he'll never win," said Panovich with a sigh. "What keeps me up at night is trying to figure out how else I can help him, what else I can do." "Maybe that's just to try and sell more Bernie Halloween masks," he added, grinning. "Since, weirdly enough, the candidate who's sold the most masks has won the general election for the last few years, since like 1996." And then, he fact-checked the date.